10% of the fresh water discharged globally by rivers, but it occupies only 1% of the global ocean volume. Annual freshwater inflow contributes as much as 10% of the fresh water in the upper 100 m of the water column in the entire Arctic Ocean. Long-term mean runoffs of the major Arctic rivers have been compiled by various scientists and UNESCO (United Nations Educational, Scientific, and Cultural Organization). The largest annual average contributions from individual rivers include the Yenisey (630 km3), Lena (532 km3), Ob' (404 km3), Khatanga (88 km3), and Indigirka (54 km3) from Eurasia, and the Mackenzie (262 km3) and other gauged rivers (209 km3) in North America. Ungauged flows surrounding the Arctic Ocean basin comprise discharges from both Asian and North American continents (total 1007 km3 per year) and Arctic islands (711 km3 per year). The total average annual river runoff is about 4270 km3; however, uncertainty and variability are taken to be high, because the discharge of Arctic rivers exhibits an extremely large seasonal variation, and also interannu-al and decadal scale variability. Fresh water delivered to the Arctic Ocean is stored in the sea ice cover, surface mixed water (the upper 30-50 m where changes including the annual melt-freeze cycle and river disposition take place), and Arctic halocline water (a complex of cold, salt-stratified layer). The riverine freshwater inflow contributes strongly to the formation of the Arctic halocline water, which is a cold (near freezing point) water mass with a salinity gradient (32-33%). The upper water column in the Arctic Ocean is dominated by cold halocline water that separates the fresh polar surface water from the underlying warmer Atlantic-derived waters. In addition to river discharge, the halocline water is formed by sea ice melt water, precipitation, and Bering Strait inflow water. The distribution and residence time of freshwater inflow critically affects Arctic Ocean circulation as well as sea ice formation related to salinity distribution. Based on observational investigation, riverine runoff signals are not evenly distributed in the upper mixed layer and halocline layer of the Arctic Ocean, depending on the surface water flow pattern. Approximately three-quarters of the river water inflow into the Arctic Ocean are discharged from the Eurasian continent of the Arctic Ocean. In particular, three rivers (the Yenisey, Lena, and Ob') are responsible for about 70% of this contribution. 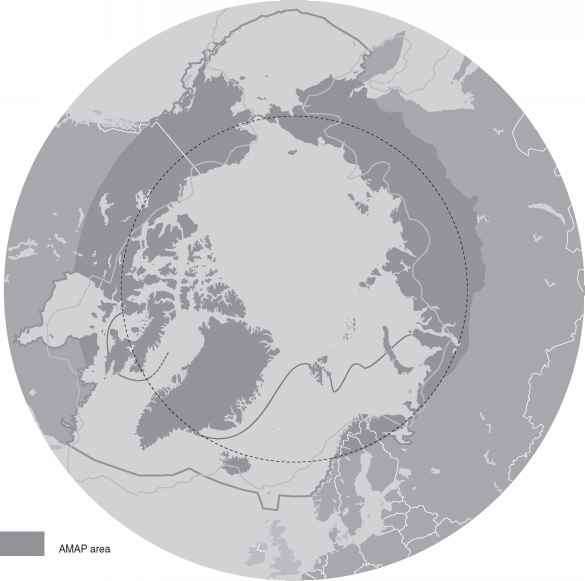 Of the Arctic freshwater budget estimated by calculating volumes relative to the salinity 34.80, which is close to the mean salinity of the Arctic Ocean, freshwater storage is 22,000 km3 on the continental shelves and 58,000 km3 in the deep basins (total mean freshwater storage, 80,000 km3). Of the Arctic basins, the Canadian Basin contains about 46,000 km3 of fresh water and the Eurasian Basin (Nansen and Amundsen basins together) contains 12,000 km3, due to the deeper halocline layer of the Canadian Basin. This is related to the less saline Bering Sea inflow water (long-term mean flow: 0.8 Sv) into the western Arctic Ocean. Bering Strait inflow supplies the halocline with two seasonally different water masses: the warm Bering Sea Summer Water (mean salinity: 32.2) and the cold Bering Sea Winter Water (mean salinity: 33.1). The halocline waters, which store a significant amount of fresh water, are ultimately exported from the Arctic Ocean through Fram strait via the East Greenland Current. Part of the fresh water transported in the East Greenland Current mixes into the center of the convective gyres of the Greenland and Labrador seas, and affects a delicate salinity balance of the surface waters. Variations in the freshwater supply to the surface waters of the gyres may have a significant influence on the deep water formation and thus deep circulation of the world ocean.